TORONTO, ON – (Marketwired – September 05, 2017) – Continental Gold Inc. (TSX: CNL) (OTCQX: CGOOF) (“Continental” or the “Company”) is pleased to announce that, as part of its sustainability strategy, it has launched Future Harvest, a program to support the agricultural development of western Antioquia. The program promotes use of the best agricultural practices to help develop sustainable economic activity in the region, while protecting the environment. Seven business plans are prioritized to use the best agricultural practices to protect ecosystems. 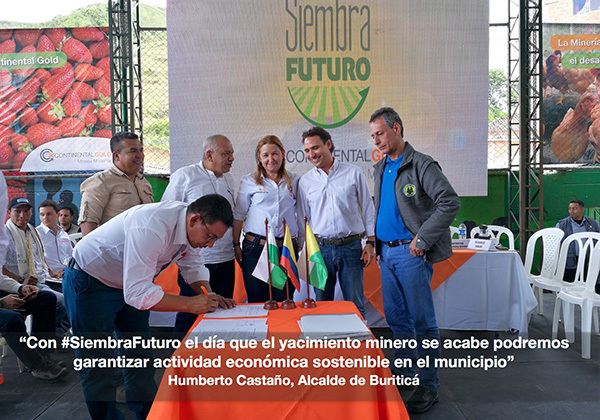 Future Harvest is expected to improve agricultural production in the municipalities of western Antioquia, within the area of influence of the Company’s Buriticá mining project, through the creation of public and private alliances and funding for the development of sustainable agriculture initiatives. To ensure the long-term sustainability of the program, Continental created the Future Harvest agricultural fund for the exclusive benefit of farmers. 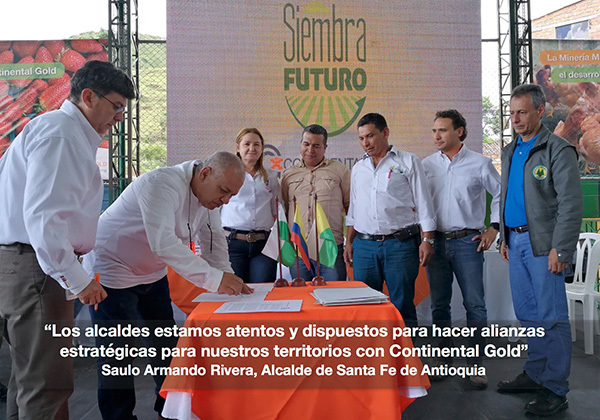 The program has initially allied with 14 private and public entities to provide solid support for this important program for the development of western Antioquia. 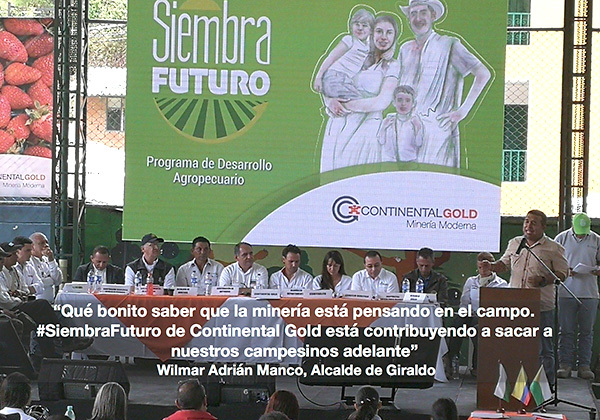 Continental plans to contribute 1,112 million pesos (US$370,000) of the total program investment of 1,554 million pesos (US$518,000) to advance the implementation of a self-sufficient sustainability strategy with productive agricultural business plans in the communities of Buriticá, Cañasgordas, Giraldo and Santa Fe de Antioquia. The first seven business plans funded under Future Harvest include programs for cultivating coffee, plantains, poultry, garden produce, strawberries, as well as fish farming and fiber production. Each business plan was structured with the communities and local and regional institutions, taking into account local productive capacities, soil productivity and quality and other variables, while promoting efficient water resource management and the use of best agricultural practices to balance development with protecting ecosystems. 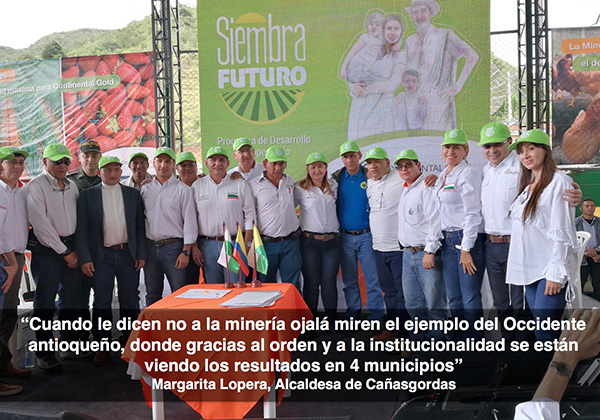 Each business plan also features the development of an integrated rural program, ongoing training and the transfer of productive assets, as well as providing access to savings programs and support regarding consumption, which have been proven to result in significant and lasting improvements on the quality of life. This news release contains or refers to forward-looking information under Canadian securities legislation, including statements regarding plans for and results of the Future Harvest program and future plans and objectives of the Company, and is based on current expectations that involve a number of significant business risks and uncertainties. Forward-looking statements are subject to other factors that could cause actual results to differ materially from expected results. Readers should not place undue reliance on forward-looking statements. Factors that could cause actual results to differ materially from any forward-looking statement include, but are not limited to, an inability to advance the Buriticá project to the next level, failure to convert estimated mineral resources to reserves, capital and operating costs varying significantly from estimates, the preliminary nature of metallurgical test results, delays in obtaining or failures to obtain required governmental, environmental or other project approvals, political risks, uncertainties relating to the availability and costs of financing needed in the future, changes in equity markets, inflation, changes in exchange rates, fluctuations in commodity prices, delays in the development of projects and the other risks involved in the mineral exploration and development industry. Specific reference is made to the most recent Annual Information Form on file with Canadian provincial securities regulatory authorities for a discussion of some of the factors underlying forward-looking statements. All of the forward-looking statements made in this news release are qualified by these cautionary statements, and are made as of the date hereof. The Company assumes no responsibility to update them or revise them to reflect new events or circumstances other than as required by law.